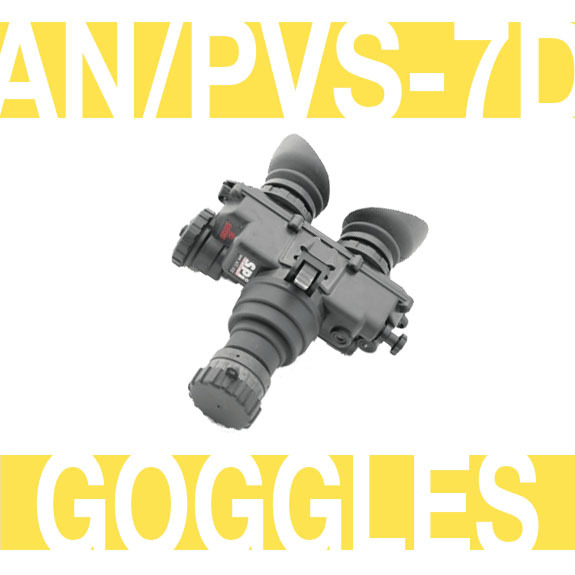 The PVS-7s are US military supply night vision goggles. Featuring Generation 3 night vision tube technology, the PVS-7 is packed with the user friendly features that work for you. The housing of the PVS 7 is shock resistant and sealed from the environment (snow, rain, wind, or even a drop in the drink). The PVS/7 is featherweight and mounts very comfortably on your head. The light weight significantly reduces operator fatigue compared to older, heavier foreign models. Auto gain control keeps you at the right level regardless of light sources in the field of view. The unit comes with a built in IR illuminator for map reading or close up work in zero ambient light situations. The IR illuminator has a visual indicator in the goggles to prevent you from accidentally leaving it on and exposing your position. Packaged in a sturdy pelican type case, the PVS 7 night vision goggles come complete with operations manual, all accessories, and a solid warranty. The AN/PVS-7D night vision goggles are currently one of the best NV observation devices on the market, together with specially calculated objective lenses and eyepiece lenses, selected 3rd generation image tubes ensure excellent light amplification and image quality. Light in weight (only 540 g) and ergonomic in design, these night vision goggles make light work even the longest observation assignments. A special head harness is included in the delivery scope which leaves the hands free for other tasks. And because of the individual focusing of the eyepiece in terms of diopters, even user that wear glasses get a great perspective. Lens 27mm military hardened & coated optics; f/1.2 std.